Kikitangeo started breeding for worm resistance in 1987 under the guidance of Dr Tom Watson and his very able technician, Mr Barry Hosking. Dr Watson is a highly respected parasitologist and geneticist. The protocols he designed for Kikitangeo to follow to achieve worm resistance are still followed by the ‘Worm FEC’ programme today. The ‘Worm FEC’ programme is the only national scheme for breeding for worm resistance. It is headed by Dr John McEwen of Invermay, who is an internationally recognised geneticist and parasitologist. Kikitangeo was the first stud in NZ to attempt to breed for parasite resistance using the latest scientific knowledge. However, this move was greeted with scepticism and a degree of ridicule by many ram breeders. When the lambs reach an average faecal egg count (FEC) of between 1000 and 1500, which generally takes from 6 to 8 weeks in the north, take dung samples from all lambs and have a laboratory given an individual worm egg count for each lamb. With an average egg count of 1000, individual counts could vary from 0 to 10,000 or more. We then look for the sires which have the lowest FEC average in their progeny (where many sires are used – 10 or more – there can be a five fold difference between the best and the worst). Obviously, the more progeny tested from a sire, the greater the accuracy. Scientist like to have 25 progeny from a sire. New sires are then selected that have low FEC’s from sires that have low average FEC’s in their progeny. However, care must be taken to ensure that these new sires are both structurally sound and have a good performance background, which often means there are compromises on FEC results. In the first ten years of the programme, progress was slow. However, we were lucky in 1999 to locate a miracle ram – KIKI 765-98. 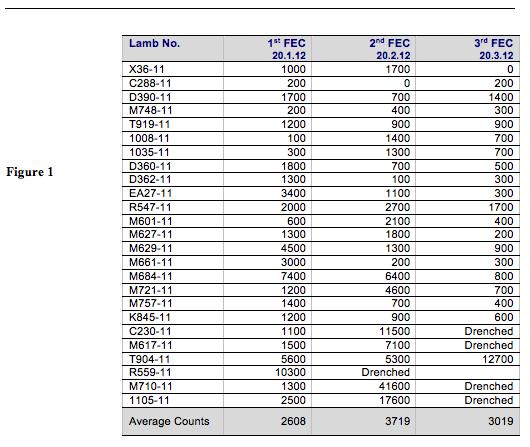 In 2001, we FEC tested 300 ram lambs born in 2000. The lambs are not only assessed on their own FEC’s, but also on their near relatives which results in a ‘Breed Value’ (BV) being given for worm resistance. In the case of parasite resistance, this is given a minus figure with –0.00 being average. Thus –30.55 is a sheep with reasonable resistance to worms. This BV results in a ranking. KIKI 765-98 had 41 sons in a test involving 300 ram lambs. Twenty four of these 41 sons were ranked in the first 24 places. KIKI 765-98 had no sons in the bottom 60% of lambs. This is a truly remarkable result, bordering on the unbelievable. But these unusual animals occasionally occur in nature and are known in the scientific world as ‘outliers’. Today all our top performing strains for worm resistance go back to this one sire. In 2006, we departed from the normal protocols. The first test was carried out as normal, but we did not drench all lambs to start the second phase. We wanted to see what would happen to the FEC’s if the lambs were left undrenched. The lambs that ‘looked wormy’ with poor eye and gum colour, and had high FEC’s – over 7,000 – were drenched. More than 80% of ram lambs that looked healthy had had lower FEC’s – under 7,000 – were left undrenched. Over the next four weeks, the lambs were carefully monitored and the occasional lamb drenched. At the end of this four week period, faecal egg counts were again taken, and as most lambs looked OK and FEC’s had not greatly increased, it was decided to give the lambs a further four weeks without drenching. At this time, sixteen weeks after the original drench, FEC’s were taken again. So we had three FEC’s at weeks 8, 12 and 16. We were amazed to find that many lambs had falling FEC’s between week 12 and week 16. Indeed, some lambs had low FEC’s over the whole period. Obviously some lambs had attained a high degree of immunity by the time they were weaned. Figure 1 shows how lambs FEC’s varied when they were left undrenched. This table shows 25 lambs out of a total of 296 lambs faecal egg counted. All ram lambs were drenched on 20-22 November 2011 while still on the ewes. The Barbers Pole worm (Haemonchus Contortus) is the major parasite threat over the November to May period. This table shows what happens to faecal egg counts if lambs are left undrenched over the December to March period. Note the average counts at the bottom of the table. The top group show that they are well under average counts and therefore have the worm challenge under control via their immune system. The middle group shows that they have withstood an early challenge and the immune system counters the challenge. The bottom group shows lambs that needed a drench to control the worms. Note one high FEC of 41600, which is not uncommon when lambs receive a real challenge. This bottom group shows what happens in flocks NOT bred for worm resistance. We are delighted that after 26 years of effort, more than half of the lambs have had only one drench in November, and have been able to thrive in spite of a high worm challenge. By contrast, our down and down cross lambs have to be drenched monthly to keep them alive, and even then some losses occur. Breeding for worm resistance is all about breeding for an immune system that can develop early and control any challenge. After 26 years (2011) of intensive selection where the worm challenge is extremely high, particularly from the blood sucking Barbers Pole worm (Haemonchus Contortus), we at Kikitangeo believe we are well on the way to controlling the worm problem. In environments where there is a lesser worm challenge, we believe that the progeny of KIKI sires will thrive with minimal or no drenching. Around 2000, three stud breeders in Hawkes Bay, Nelson and Southland found that the progeny of KIKI sires had a reduction of FEC’s of between 50 and 60 percent. At Kikitangeo, ewes, including 2 tooths, have not had any form of drench for more than a decade. Conversely, in our down flocks – Suffolk and Southdowns, adult sheep, both ewes and rams, have to be drenched on a regular basis to keep them alive. Unfortunately, we do not always succeed.